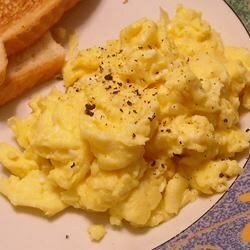 "These are the traditional scrambled eggs that everyone loves. It's a great and easy recipe anyone could learn!" I just made these eggs for my mom, on Mother's Day, for breakfast in bed. She loved them! However, I just put in a sprinkle of salt and a sprinkle of pepper. Thanks so much!